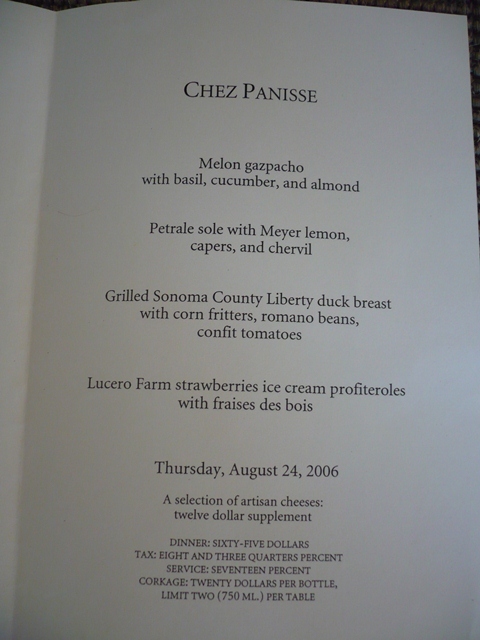 One of my most memorable meals was that at legendary Chez Panisse. It was five years ago, and yet I think that I'm still on a high about the whole experience. 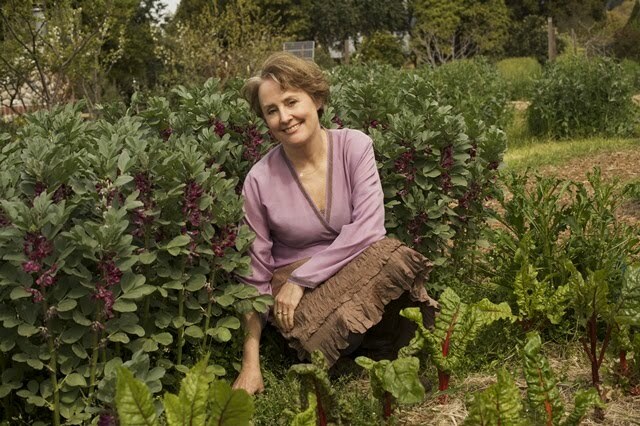 For foodies and wannabe foodies, Alice Waters' Berkeley restaurant is like Mecca. You have to dine there at least once in your life. Chez Panisse is celebrating its 40th anniversary in August of this year, its longevity a testament to Waters' innovative cooking and her emphasis on fresh, locally grown produce. 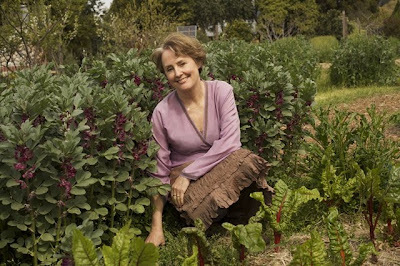 It was this passion for healthy, organic cooking that led Waters to later start the Chez Panisse Foundation which promotes school lunch reform and The Edible Schoolyard for public school children. 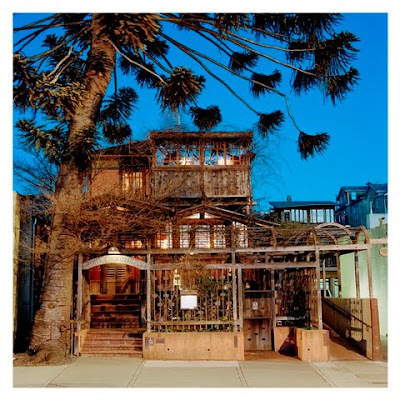 In honor of the restaurant's upcoming anniversary, One Kings Lane has partnered with Alice Waters to offer different Chez Panisse experiences to One Kings Lane members. 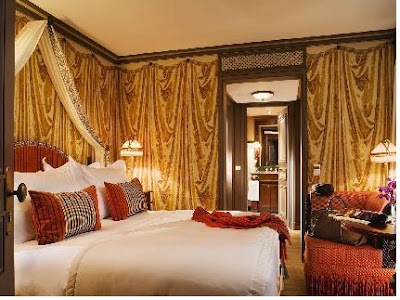 The sale, which runs now through July 1, includes different packages like tickets to the 40th anniversary celebration and even an opportunity to cook in the Chez Panisse kitchen for a day- and all of it is tax deductible. 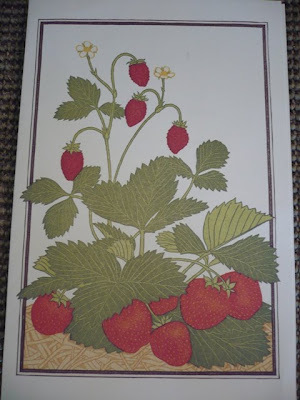 The proceeds from the sale benefit the Chez Panisse Foundation. How cool is that? If the cost of the experiences are a little outside of your budget, by all means check out the In the Green Kitchen sale, also running through July 1, which features Waters' picks for the kitchen. And just for fun, I took a few photos of the menu from my dinner at Chez Panisse. There was no way that I was going to throw it away! I like to surround myself with things that have provenance. An impressive provenance is not a requirement, mind you, although I would be thrilled to own something once owned by someone I admire: Albert Hadley, Van Day Truex, or Dorothy Draper, for example. And I don't think that anything in my house has a really, really fine pedigree. 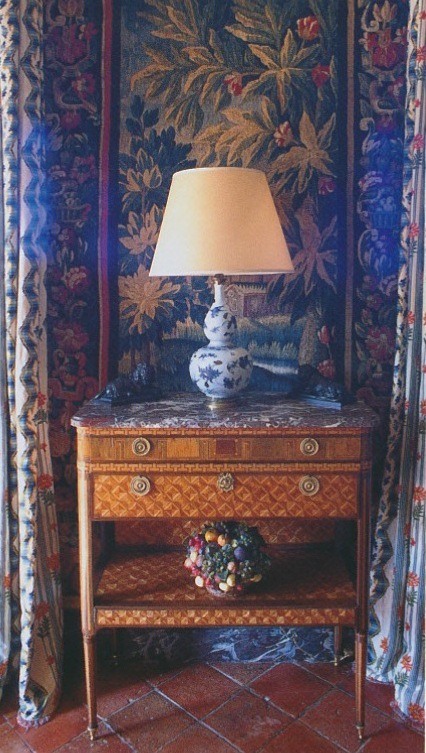 I have some nice pieces, but nothing by a blue-chip designer like Boulle, Kent, or Frank. The kind of provenance that is important to me is one that connects me to someone or some place important in my life. One that establishes a connection to one of my grandparents, say, or to my Atlanta roots. Something that tells a story. Story, to me, is most important. Take my headboard. It has a curvy black wrought iron frame that comes to a point at top, capped with a fleur de lis; the interior is upholstered in gray mohair. It's nice looking and unique, but it's the history behind this piece that I just love. The frame actually used to be a outdoor sign, one owned by Charles Willis, the old Atlanta jeweler and tabletop purveyor. In fact, the companion sign frame still sits on Peachtree, holding the Dante's Down the Hatch sign. (Dante's, by the way, is a fondue restaurant/ jazz club that has been around since the 1970s.) Some of you might remember that the house that holds Dante's used to house Charles Willis. See? That's a story, one that probably does not mean much to most of you, but it's one that reminds me of the good old days in Buckhead. 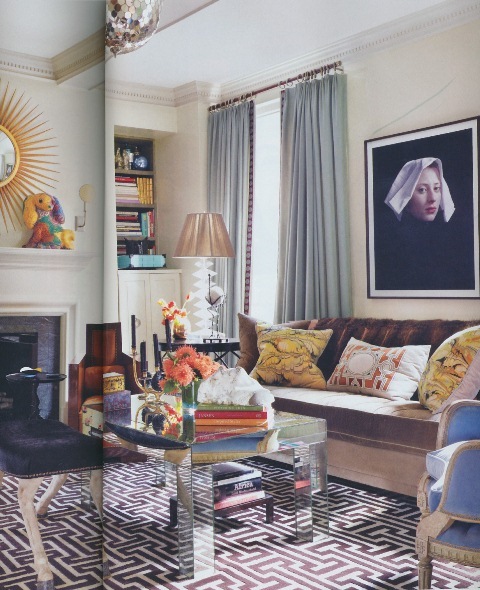 There's also my framed 1930s photo of the actress Irene Dunne. Truth be told, I have never cared for Dunne; whenever I see one of her movies, I find myself getting a little irritated. But, she was my late grandmother's favorite actress. My grandmother's friend happened to be down in Sea Island, Georgia at the same time that a young Dunne was visiting the resort, and she somehow took or obtained the photo of Dunne standing outside of the Cloister, in turn giving it to my grandmother. Not only does this photo remind me of my grandmother, it also makes me think of all of the summers that I used to spend down at the Cloister. That's a double connection. So now I'm contemplating buying a new dining table, and I'm strongly considering getting a Platner dining table. First and foremost, it's a really good looking table, one that is now considered to be a classic. And, it looks great with more traditional table accessories. (Just look at all of the yummy examples below.) But, seeing that I'm a nostalgia seeker, there is another reason. It was a Platner chair like that at top that was the first piece of modern furniture that made an impression on me. My mother used to take my sister and me to the dress department at Neiman Marcus where we would sit in Platner chairs, ones that spun around much to our delight. 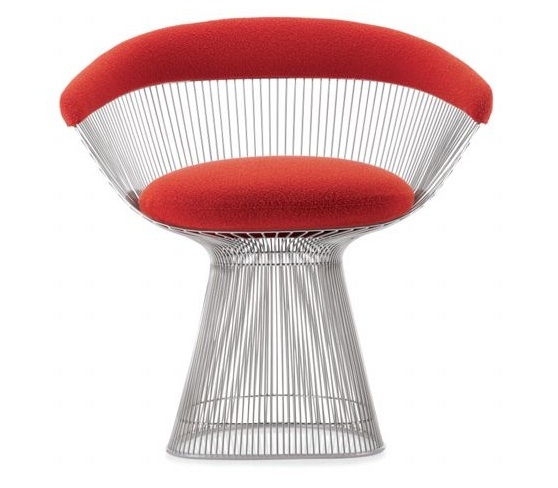 Platner's design seemed awfully exotic to me, as did all of that late 1970s fashion at Neiman's. And you know? A slick table like this would add a little edge to my antique French sideboard. 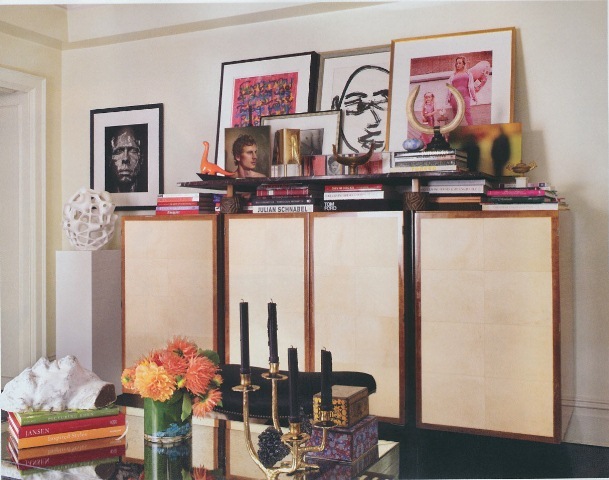 Oh, and by the way, my parents bought the sideboard at Rich's department store which, at that time, employed the soon to be legendary designer Dan Carithers as its home furnishings' design director. Good grief. I just can't stop making these connections. It must be a sickness, and an exhausting one at that! 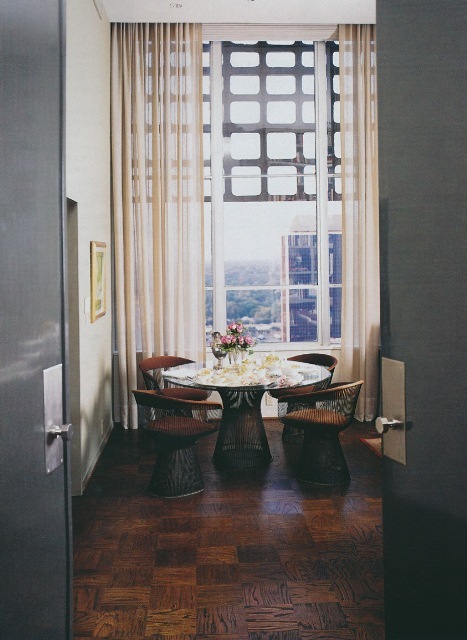 A Platner table and chairs in the Dallas penthouse of Pat Patterson. 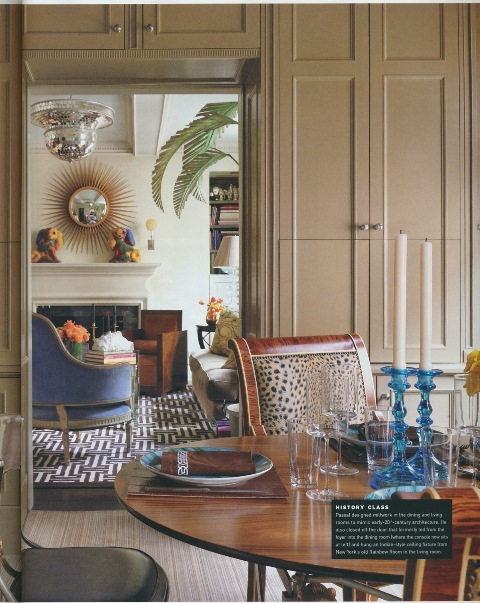 Jonathan Adler used a Platner table in this dining room that he designed. 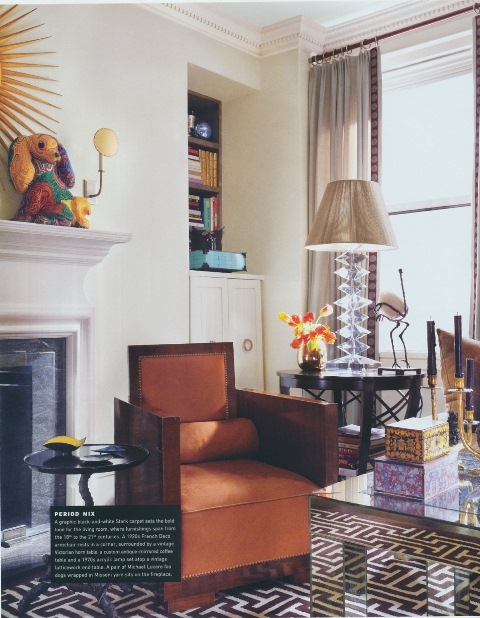 Patterson photo from Elle Decor, May 1999; Ka Yeung photographer; Andrew photo from Elle Decor; Adler photo courtesy of his website. Back in 1968, Anne d'Ornano was officially known as Comtesse Michel d'Ornano, but by 2000, she had also added mayor of Deauville, France to her list of titles. 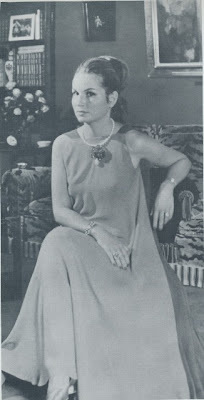 Despite the fact that in the T&C book Anne said that she preferred being a guest at dinners and parties because "I'm basically lazy", Nan Kempner seemed to take a very different view of her. 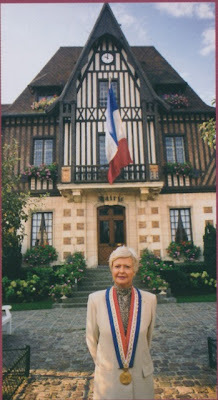 Kempner wrote "I always marvel at how effortlessly she manages to juggle all her roles" including mother, grandmother, mayor of Deauville, the counsel general of Trouville, and the President of the General Council of Calvados. Lazy? Hardly. 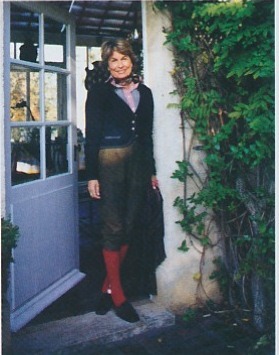 Like her sister in law Isabelle, Anne has had the luxury of employing personal chefs in her homes. For the dinners that she hosted thirty years ago, she liked to serve dishes such as "stuffed eggs on hearts of artichokes with truffles and sauce béchamel; roast beef with prunes stuffed with mousse de pâté and salade mimosa; cheese; and cold soufflé de fraise. And just as Isabelle, Anne seems to have taken a more casual approach to entertaining over the years. 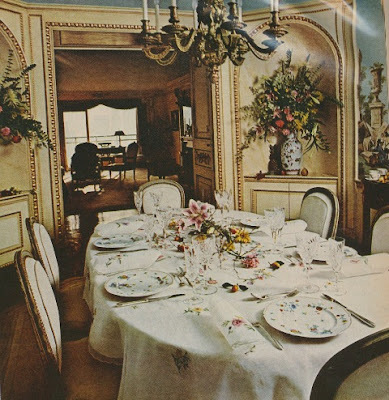 When Kempner visited Anne for lunch at her Deauville house, the meal started with a scallop salad followed by poached turbot with beurre blanc and stuffed tomatoes. Dessert was a tarte tatin. Kempner noted that Anne prefers to serve the main course buffet-style in an effort to keep things easy. And, it seems that her menus have lightened up immensely as evidenced by the lack of a béchamel sauce. 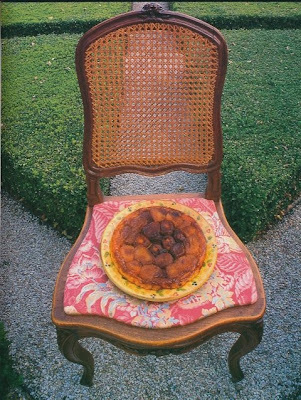 I have to say, though, that what might impress me even more than her style, her menu, or that tarte tatin is the abundance of Boxwoods lining the home's front walk. (See below.) Talk about a good first impression! 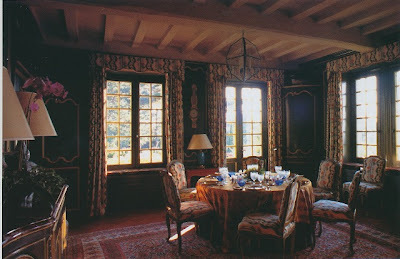 The interior of Anne's home. The front walk that is lined with Boxwoods. All color images from R.S.V.P. : Menus for Entertaining from People Who Really Know How by Nan Kempner; Quentin Bacon photographer. 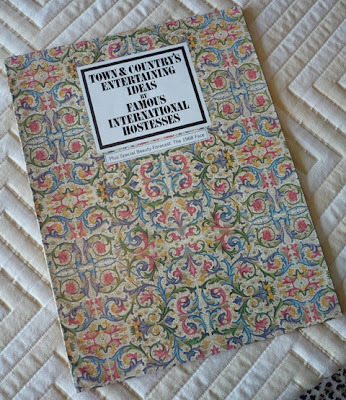 One of my favorite books on entertaining is my 1968 issue of Town & Country's Entertaining Ideas by Famous International Hostesses. I admit that what first caught my eye was the cover, one that was reminiscent of Florentine paper. And I should clarify that it's not really a book, either. I assume that it was a supplement to the magazine. There are no recipes in the issue, but that's fine by me because it is filled with glamour shots of stylish, social women from New York, Paris, Madrid, and Beirut. Each one was asked for her tips and thoughts on entertaining, and while some of their advice is a little dated, much of it still seems germane. 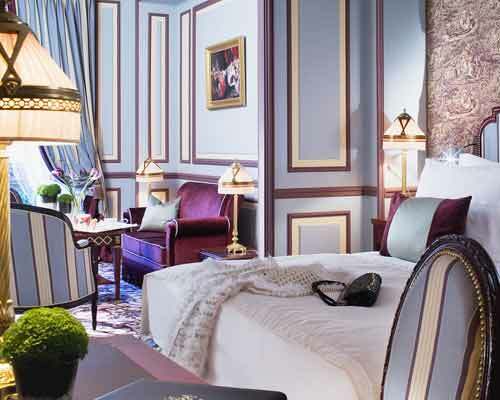 It recently dawned on me that two of the featured hostesses, sisters-in-law Comtesse Hubert d'Ornano and Comtesse Michel d'Ornano (their husbands founded the Orlane skincare line and later Sisley), also made appearances in Nan Kempner's R.S.V.P. 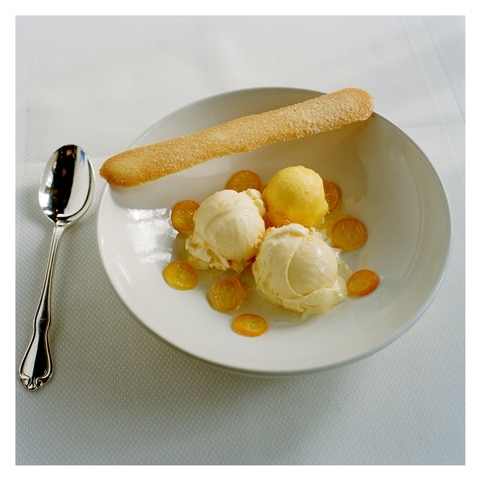 : Menus for Entertaining from People Who Really Know How . 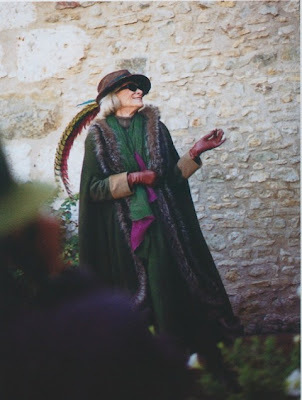 I thought it would be interesting to see how the women's styles of entertaining changed in thirty years. So, first up is Comtesse Hubert d'Ornano. In the T&C supplement, the Polish-born Isabelle mentioned that despite the fact that she had chefs in both her Paris and country homes, she herself liked to cook "Polish specialties, borsch, blinis with caviar, or smoked salmon." 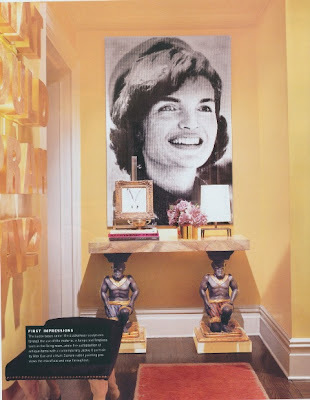 Her attention, though, was lavished on the shooting weekends that she and her husband hosted. 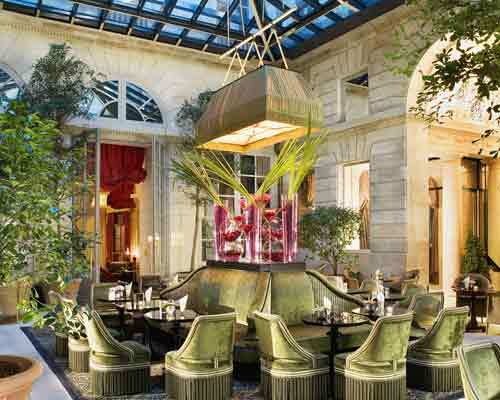 "Friday, an informal dinner. 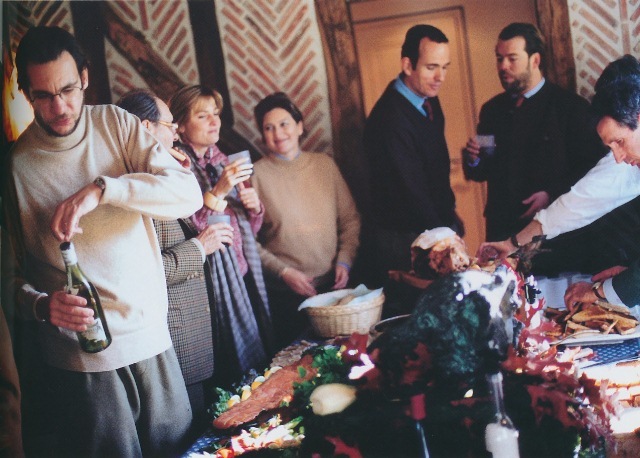 Lunch Saturday at the shooting lodge...During the shoot if it's cold, hot wine and consomme are served. Saturday night's a black-tie dinner, music and cards after. Sunday's breakfast-lunch is in the shooting lodge: eggs, mixed grill with wild rice, local cheese, une tarte pruneau with fresh cream. 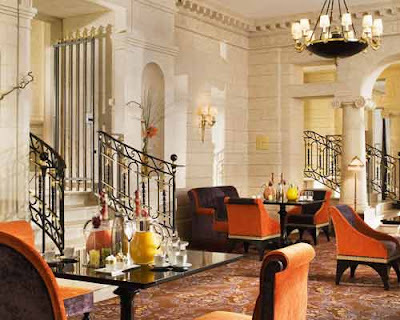 'We shoot all day, return to the lodge for high tea at 6pm. Meanwhile the luggage has been prepared and put into the guests' cars so that they can leave directly after tea.'" 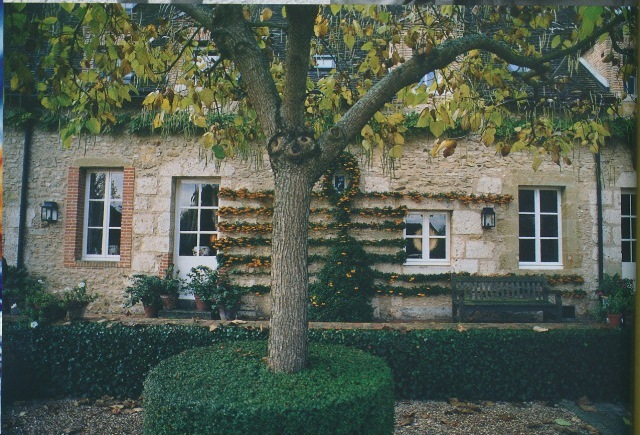 Shooting must be quite important to Isabelle and Hubert as Kempner's book also features a shooting weekend chez d'Ornano circa 2000. This time, the hunting lunch included bull shots (this was one of Kempner's favorite cocktails, so I wonder if this was served in her honor?) 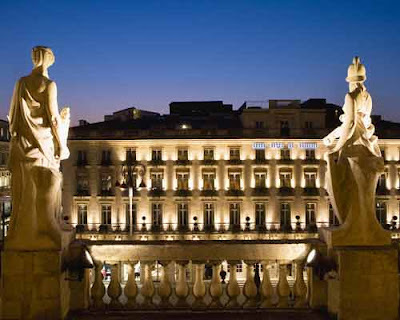 and a buffet of dishes like moussaka, truffled scrambled eggs en croûte, and pizza à la d'Ornano. Afternoon shooting was followed by tea just as it was thirty years earlier. 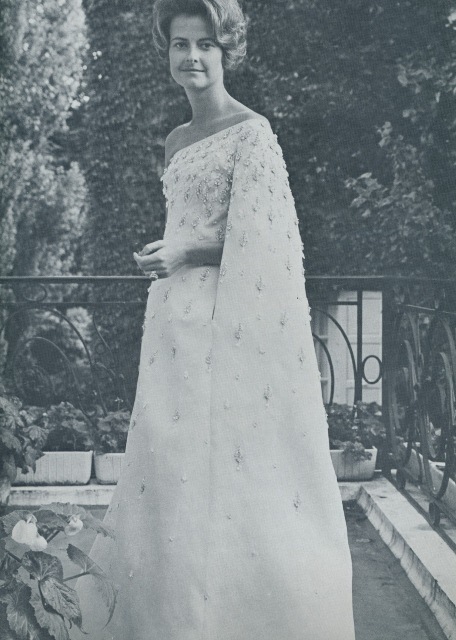 But Kempner wrote that while the weekend's festivities were traditional, that "does not mean formal." Dinner, just as lunch, was also served buffet style. It sounds as though d'Ornano's style of entertaining has loosened up over the years, just as I think it has for most of us. 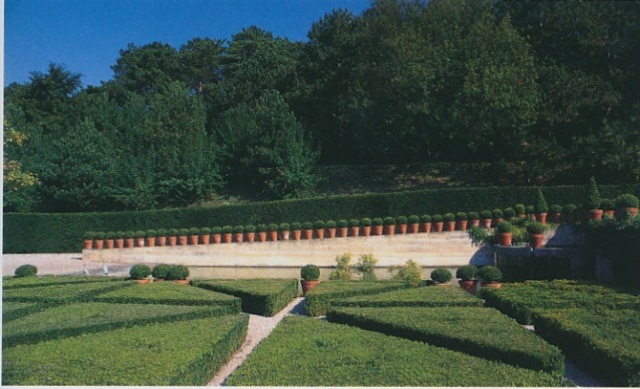 La Renaudière, the six thousand acre Loire Valley estate that d'Ornano and her husband call home. 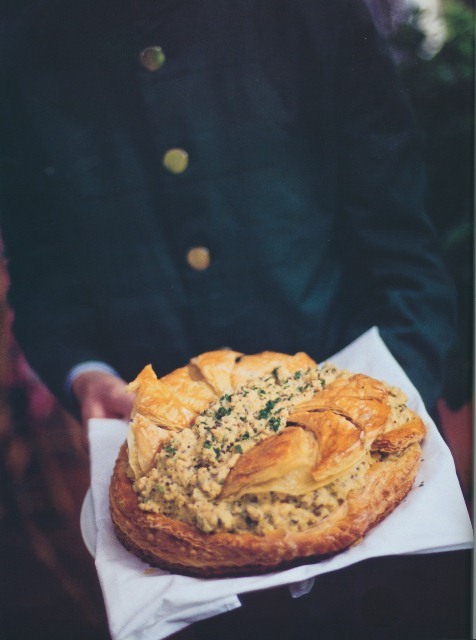 Truffled scrambled eggs en croûte. 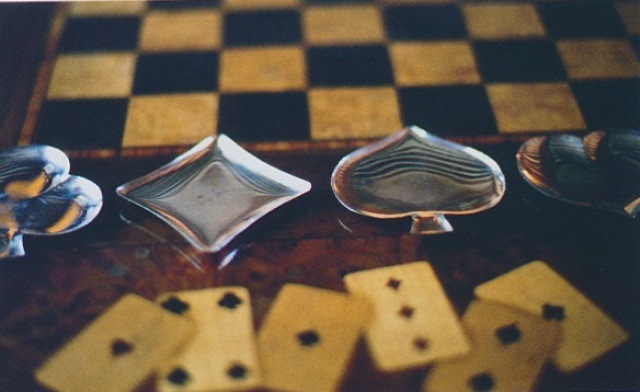 An after dinner game of cards has stood the test of time. One of my very favorite photos of Nan Kempner! d'Ornano color photos from R.S.V.P. 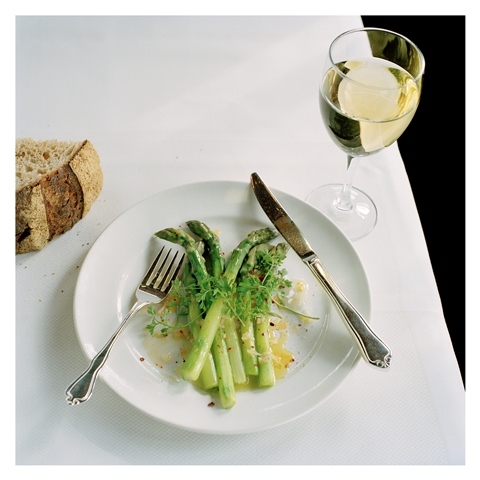 : Menus for Entertaining from People Who Really Know How by Nan Kempner, Quentin Bacon photographer. I'm really distracted this week by an interesting project, one that requires my time and focus. I suppose that is my feeble explanation for why some of my posts this week will be light on text, heavy on the photos. So let's kick off the week with photos of designer Robert Passal's Gramercy Park apartment which appeared in the Spring issue of Luxe magazine. For those of us who live in apartments, the challenge seems to be creating plenty of seating, finding a place for dining, and carving out space for storage, all in the confines of a small space. (By the way, when I use the word apartment, I mean apartments and condos. I just don't like the word condo, for whatever reason.) 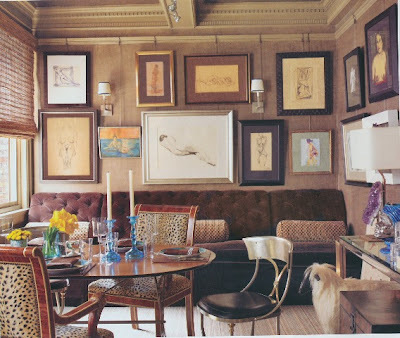 I think that Robert made great use of every inch of his home's space, and yet the overall feel seems anything but cramped. What I think you can take away from these photos is that living in an apartment requires strict editing. And that, my friends, is something that I have learned all too well living in my own condo. I mean, apartment. I am completely charmed by this article, "Party Tables Set Like Gardens", that was published in the May 1971 issue of House & Garden. 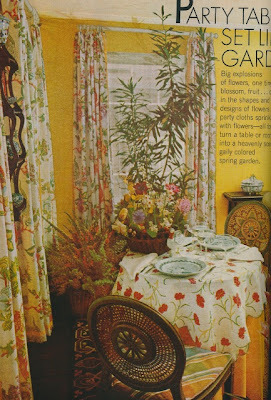 As was written in the article, "Big explosions of flowers, one tiny blossom, fruit...china in the shapes and designs of flowers...party cloths sprinkled with flowers-all to turn a table or room into a heavenly scented, gaily colored spring garden." Amen. I do a weakness for floral table linen and china (one of the few places in my house where floral prints make an appearance.) And if you don't have the luxury of having your own garden, why not create one in the dining room? The beauty of it is that the weather will never rain on your parade...nor your dinner parties and luncheons. Image at top: A luncheon table set with a centerpiece of flowering quince, mimosa, carnations, and lilies on an embroidered organdy cloth. 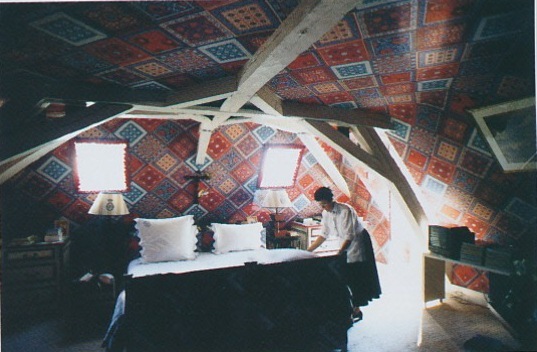 The interior design of the room was the handiwork of Richard Neas. A Welcome to Spring Luncheon replete with sprays of lily of the valley in pink glasses and Porthault mats and napkins. Strawberry soup was served in crystal bowls placed on top of fern cuttings. A spring lunch for two. 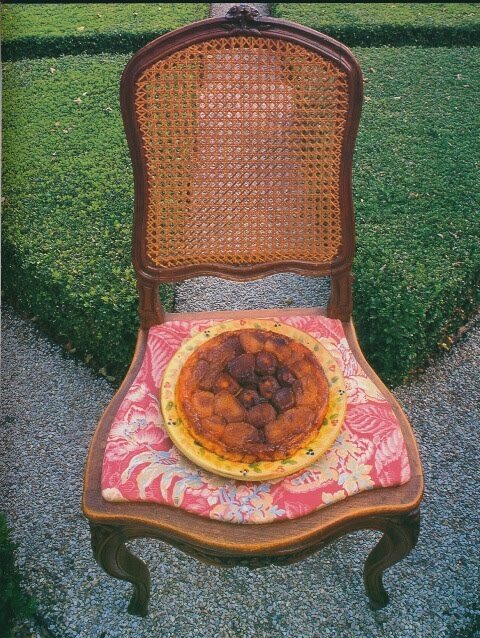 A carnation print Porthault cloth was placed over an egg-yolk yellow table skirt. Wedgwood's "Chusan" dinner plates with their white quince pattern added to the abundance of flowers. 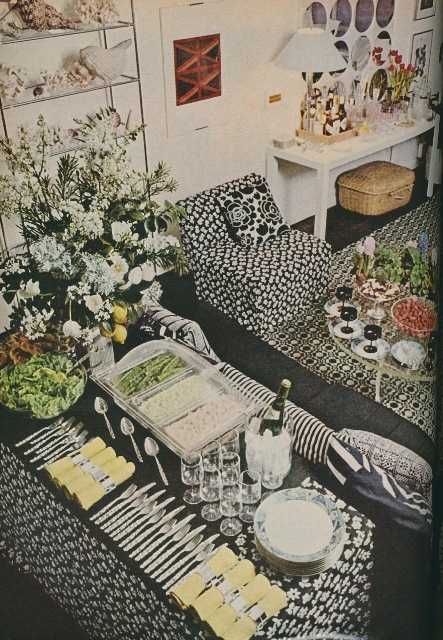 There is a gracious plenty of everything in this room: food, flatware, napkins, glassware, and pattern. The potted hyacinth, placed around a big bowl of strawberries on the cocktail table, is a nice touch. In case you're wondering, the chafing dish holds Seafood Newburg and rice. It photographed a little bland, but I bet it didn't taste that way. 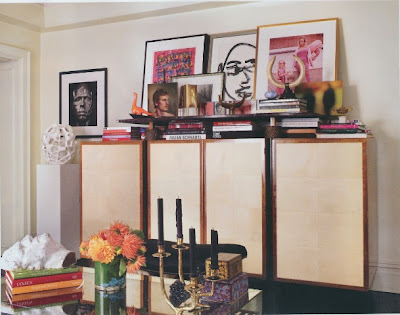 The lilac colored apartment of designer Bebe Winkler. I covet that table (maybe by Bielecky Brothers?) 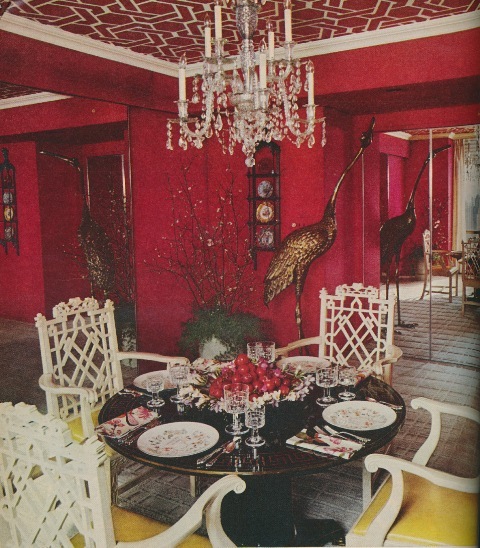 The china was a collection of stackables called "Chromatics" by Block. I probably wouldn't serve wine in that colored glassware, but I do like that pinky/amber colored goblet. A red lacquered dining room decorated by Joseph Braswell. 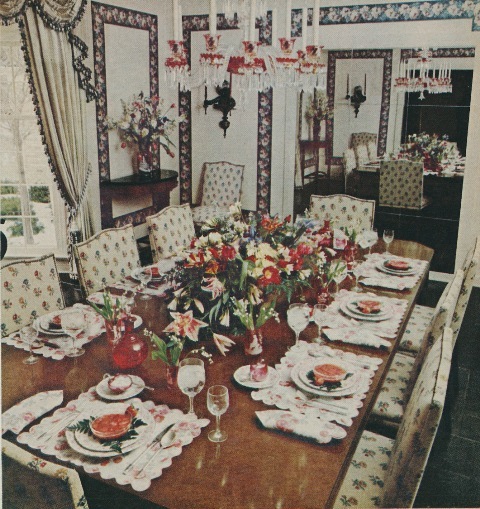 The table was set with "Medici" flatware, "Chinoiserie" china, and "King Richard" crystal, all by Gorham. 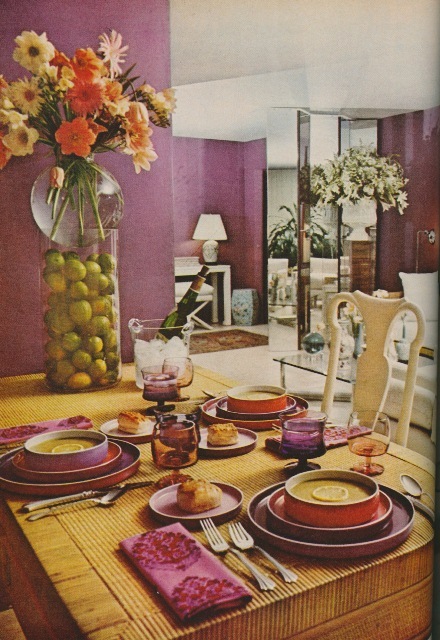 The centerpiece was made of plums and white and lavender freesia. I can't figure out why I've got such a bad case of wanderlust. Too much work, perhaps? Let's see, in the past month I've written about cooking school in England, a palace in India, and today, we're talking about Bordeaux...the Regent Grand Hotel Bordeaux, that is. 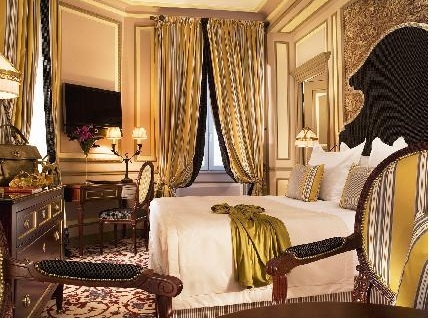 I am so taken with the Jacques Garcia designed interiors, especially the rich colors, the abundant use of velvet, and the guest rooms' quirky headboards. It's a heady yet refined kind of maximalism of which Garcia is the master. It might seem odd to be thinking of decadent decorating during the dog days of summer, but if you ask me, there is no off-season for opulence. 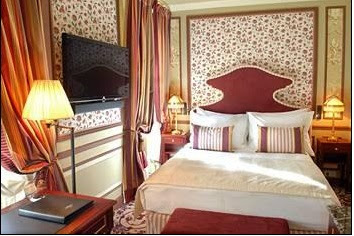 It's the combination of colors in this suite that I'm taken with. 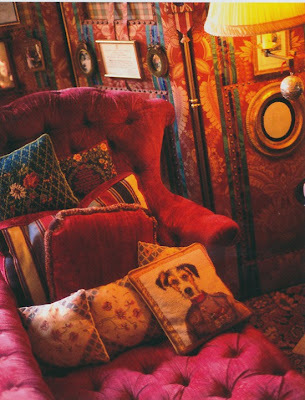 That and the aubergine velvet sofa. The perfect place to crash after drinking all of that amazing wine that you're sure to have. 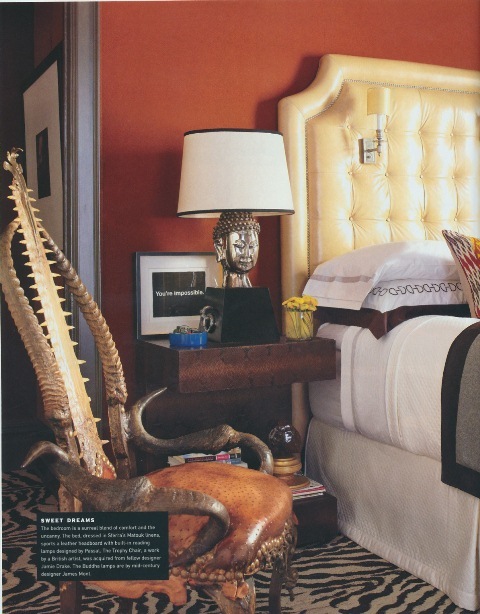 The headboard has such an interesting shape. 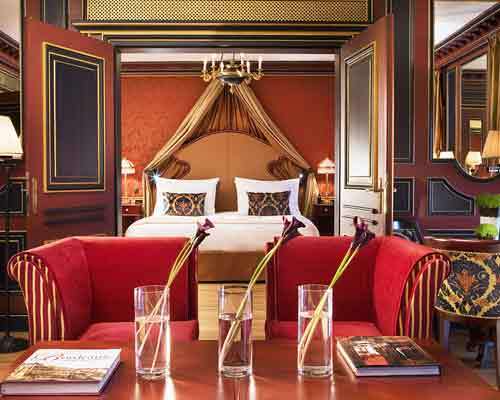 This room has accents of black. The trompe l'oeil wallpaper reminds me of that by Mauny. 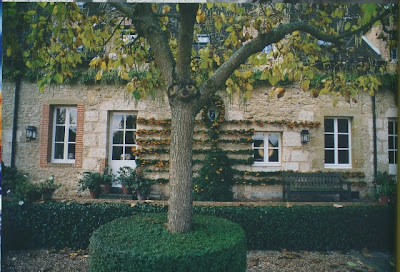 Moss green velvet and bullion fringe in l'orangerie.